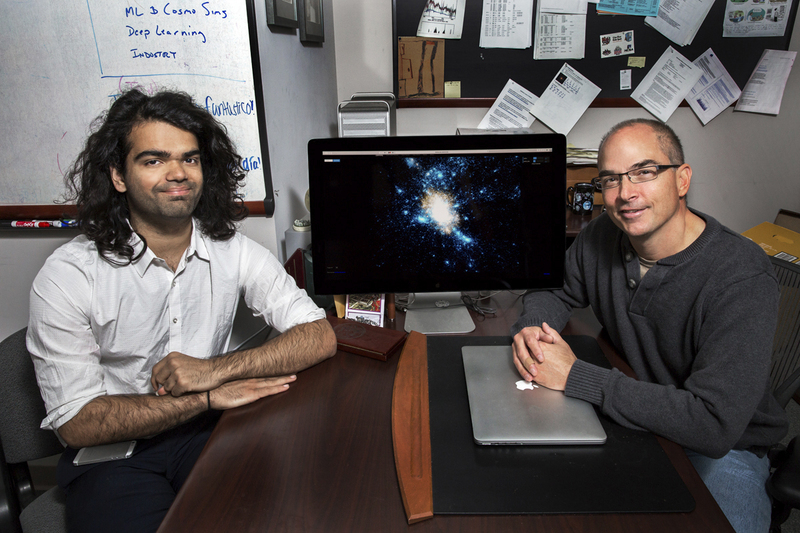 A new, faster modeling technique for galaxy formation has been developed by University of Illinois student Harshil Kamdar and professor Robert Brunner. The technique uses machine learning to cut down computing times from thousands of computing hours to mere minutes. CHAMPAIGN, Ill. — A new machine-learning simulation system developed at the University of Illinois promises cosmologists an expanded suite of galaxy models – a necessary first step to developing more accurate and relevant insights into the formation of the universe. The feasibility of this method has been laid out in two recent papers written by astronomy, physics and statistics professor Robert Brunner, his undergraduate student Harshil Kamdar and National Center for Supercomputing Applications research scientist Matthew Turk. Cosmologists currently use two simulation approaches. The first is an N-body simulation, which models how dark matter collapses under gravity. These simulations, when coupled with a semianalytical model, let astronomers model how galaxies form. The second is a hydrodynamical N-body simulation, which lets astronomers directly model how normal matter interacts with dark matter under gravitational collapse to form galaxies; this more computationally intensive approach directly shows how invisible clumps of dark matter, referred to as halos, influence star formation. Hydrodynamics, Brunner said, gives cosmologists the most accurate information when it is accounted for in N-body simulations. But there’s a drawback to using hydrodynamical simulations: They take up millions of hours of supercomputing time, which racks up an often unaffordable bill for research projects. Machine learning uses computer algorithms to identify relationships in high-dimensional data. The Illinois team developed a machine-learning algorithm to map the relationship between dark matter haloes and their normal matter counterparts in hydrodynamical galaxy simulations. Machine learning cuts computing time by approximating the properties a researcher wants to look at using an algorithm that’s been trained on one of the rare, millions-of-hours hydrodynamical simulations. While the exact placement of dark matter and particles might be off, the team showed the predicted distribution of galaxies and their properties is nearly spot on, with both hydrodynamical N-body simulations and semianalytical models. “The analogy would be using machine learning to predict scores of students in a class. We wouldn't get each student's score right, but the distribution of scores would be right,” Brunner said. In the first paper, published in the Monthly Notices of the Royal Astronomical Society, the researchers demonstrated that machine learning was able to recreate a distribution of galaxies similar to those produced by semianalytical models. In a second submitted paper, now available on ArXiv, they compared the machine-learning method to hydrodynamical simulations, mapping galaxies at the particle level, and again found that the machine-learning paradigm performed well. Their future work will include populating a dark-matter-only simulation with galaxies using machine learning in the computational time of mere minutes. The new machine-learning framework could then be used to create quickly simulated maps of galaxies to compare to observations. The new method holds promise for surveyors who compare their observations to simulations. This includes both the Dark Energy Survey and the upcoming Large Synoptic Survey Telescope, both of which will be cataloged at the University of Illinois. The National Science Foundation supported this work. Brunner also is affiliated with the Beckman Institute for Advanced Science and Technology. Editor’s notes: To reach Robert Brunner, call (217) 244-6099; email bigdog@illinois.edu. The papers “Machine Learning and Cosmological Simulations I: Semi-Analytical Models” and “Machine Learning and Cosmological Simulations II: Hydrodynamical Simulations” are available online.